Datchet’s WWI memorial lists ‘Nugent, Leslie, Scots Guards, Lieutenant’. This was a puzzle as there was no Lieutenant Leslie Nugent from Datchet in the Scots Guards. 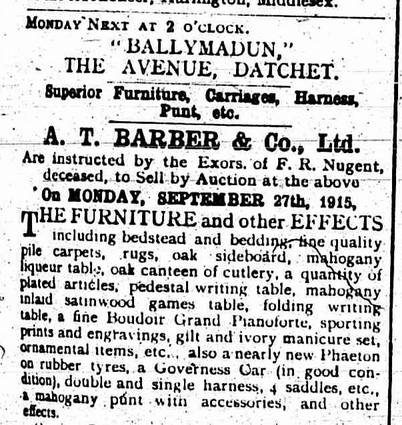 There was, however, a Lieutenant Richard Francis Robert Nugent, left, whose address was Ballymadun, The Avenue, Datchet. We believe that ‘Leslie’ was Richard. He was quite new to the village when war broke out and may not have been well known. It is thought that ‘Leslie’ was his nickname. 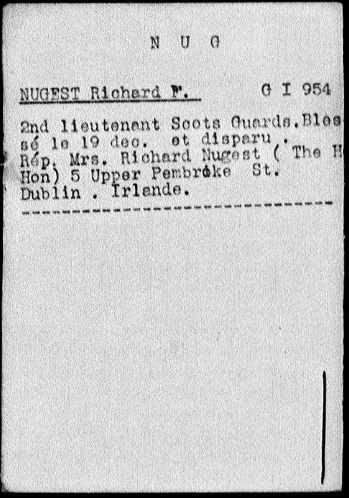 Richard was born on 3 October 1884 and baptised at Westland Row, Dublin. 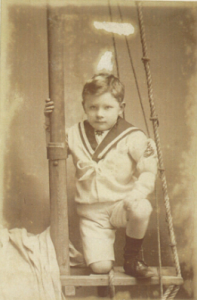 He was the son of the Honourable Richard Anthony Nugent (1842-1912), and grandson of the 9th Earl of Westmeath. His mother was Theresa Henrietta Gradwell of Dowth Hall, Drogheda. He was one of at least six children, three girls and three boys. His elder brother Anthony Charles St George died from diphtheria in 1891 and his younger brother Hugh Fulke George Riverston died in 1901. His sisters were Mary Theresa, Anne Christian and Rose Henrietta. Richard remained single and was a member of a number of London clubs including the Guards’ Club, Bath Club and Bachelors’ Club, as well as the Kildare Street Club in Dublin. He was a keen rider and hunted with many packs of foxhounds in England and Ireland. He also rode in Brigade point-to-point races and was first whip to the Household Brigade Drag in Windsor. The Household Brigade had become interested in the sport, where horses and hounds follow a prepared scented trail, because the riding and jumping it entailed were excellent preparation for the cavalry. The Prince of Wales (later Edward VIII) sometimes hunted with them too. This involvement with the Household Brigade Drag may explain why Richard chose to move to Datchet sometime after 1911 and before the start of the war. 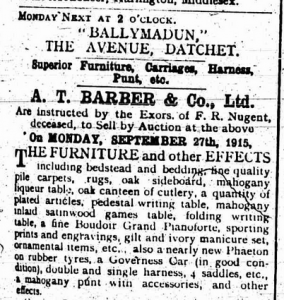 He obviously intended to settle for a while in the village as he listed his details to be published in the 1915 edition of Kelly’s Directory. When war was declared, Richard offered his services to the military. 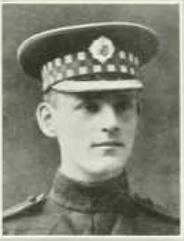 These were accepted and, after training at Warley and Sandown, he embarked for France early in November 1914 to join his former battalion, the 2nd Battalion Scots Guards. He arrived in France during the First Battle of Ypres (19 October to 22 November 1914), when the Allies captured the town from the Germans. His sister, Rose Henrietta Emily, died on 15 December 1914, but it is thought that news of her death would perhaps not have reached Richard. 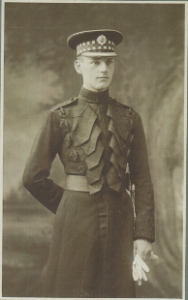 During an attack on the night of 18-19 December 1914, Richard was last seen standing on the top of a German trench, somewhere between Fleurbaix and Fromelles, encouraging his men forward to attack the enemy. Richard was reported in the official list as missing in action. Later in December he was reported, erroneously, as wounded and a prisoner. Enquiries were made but there was no trace of him in any of the prisoners’ camps in Germany. 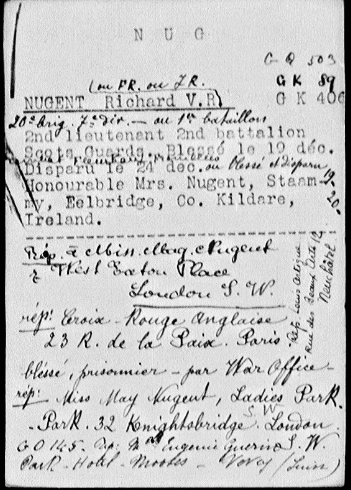 The International Red Cross kept record cards of his details, below, so that he could be identified if found. Richard’s sister May (Mary Theresa) Nugent, who was living in London, searched desperately for news of her brother’s fate. According to a report in the Ir ish Times in June 1915, right, she went everywhere in England where she thought she could obtain information, and followed up every clue. She had inquiries made through the casualty department of the War Office, the British Red Cross Society and the American Embassies in Berlin, Copenhagen and Washington and also by a private inquiry agent. 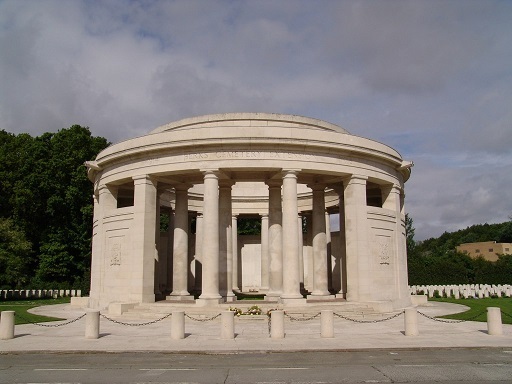 She also contacted Major Paynter, one of the surviving officers of the regiment, but had not been able to get information beyond the fact that on 18 December her brother took part in an attack on the German lines. Eventually she had to conclude that her brother was dead. He had taken part in the attack on the trenches and was seen by two privates who stated that he was shot on the parapet protecting the German trenches. Almost immediately afterwards, his section had to retire owing to the severity of the German fire. Some wounded men were brought back but Richard was not among them. In The Christmas Truce: The Western Front December 1914, written by Malcolm Brown and Shirley Seaton, (panmacmillan, £14.99), there is evidence to suggest that Richard was buried by the German soldiers: ‘The Adjutant of the 2/Scots Guards, Captain Giles Loder, had led the battalion’s attack on 18 December. 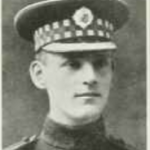 On Christmas morning he was in the front-line trenches away to the right and observed the activity going on opposite the Gordon Highlanders as the bodies were collected and the graves dug. So he climbed over the parapet and walked over the half-mile of open farmland to talk to the Germans and arrange burial for the Scots Guards killed in the same attack. He spoke with “an extremely pleasant and superior brand of German officer, who arranged to bring all our dead to the halfway line”. There were 29 in all, most of them lying close to the enemy wire. Loder sorted through the bodies, collecting the personal effects, paybooks and identity discs. “It was heartrending”, he wrote later that day in the battalion War Diary, “to see some of the chaps one knew so well, and who had started out in such good spirits on December 18, lying there dead, some with horrible wounds due to the explosive action of the high-velocity bullet at short range.” He detailed some men to bring in the rifles of his comrades but the Germans demurred at this; indeed, all rifles lying on their side of the halfway line they kept as spoils of war. Richard Francis Robert Nugent is remembered on panel 1 of the Ploegsteert Memorial, 12.5kms south of Ieper (Ypres) in Belgium. He is also remembered on a plaque at St Andrew’s Church, Westland Row, Dublin, and on the WWI memorial in Datchet. He was awarded the British War, Victory Medal and 15 Star. A short obituary of Richard’s life appears in The Bond of Sacrifice, a Biographical Record of All British Officers Who Fell in the Great War Volume 1. 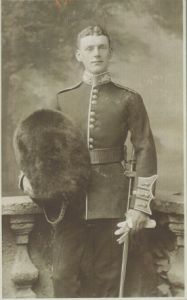 With grateful thanks to Richard’s great niece, the artist Anita Puigcerver Rumbold, for her help researching this piece and for sharing her family photographs.